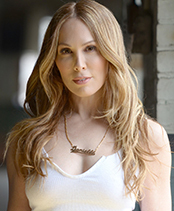 Danielle Flora began her career in choreography working on hit TV shows such as Saturday Night Live, The Tonight Show, 30 Rock, and Flight of the Concords where she worked with many talented actors and musicians, including Beyonce, Justin Timberlake, JLo, Tom Cruise, Brad Pitt, and Anne Hathaway. She continued building a resume of credits in television, commercials, and film and went on to work on live shows such as the MTV Video Music Awards, Country Music Awards, and TV Land Awards. Danielle’s television credits include 30 Rock, Flight of the Conchords, and Inside Amy Schumer. And her movie credits include Date Night, The Intern, and Trainwreck, which was Judd Apatow’s second biggest debut as a director. 2015 marked her first season of the worldwide, Primetime Emmy nominated Lip Sync Battle on Spike TV where she took on the role of creative director and lead choreographer for the first two seasons. She made her debut as a Producer for seasons three and four while continuing her role as the choreographer for some of the biggest stars, including Neil Patrick Harris, Hailee Steinfeld, Channing Tatum, Josh Gad, Kaley Cuoco, and Laverne Cox. Currently, she is producing and choreographing the second season of the hit Nickelodeon show Lip Sync Battle Shorties. Through her work with live TV and live scripted shows, Danielle is known for her ability to visualize, conceive, and execute dynamic and entertaining choreography in very little time – with any type of talent. She won an Emmy for her work on SNL and has been nominated for a Primetime Emmy for Lip Sync Battle. Danielle lives in New Jersey with her daughter and husband. She splits her time between coasts as she continues to work on SNL, LSB, and LSB Shorties. The Tonight Show Staring Jimmy Fallon, "Footloose"
The Onion, "The A-Rod Musical"
30 Rock, "I See Myself in You"
The Tonight Show, "Evolution of Mom Dancing"
The Tonight Show, "Evolution of Hip-hop"